Bottom images: a great sculpin in the process of eating a spot prawn. Photos by Kelly Fretwell. 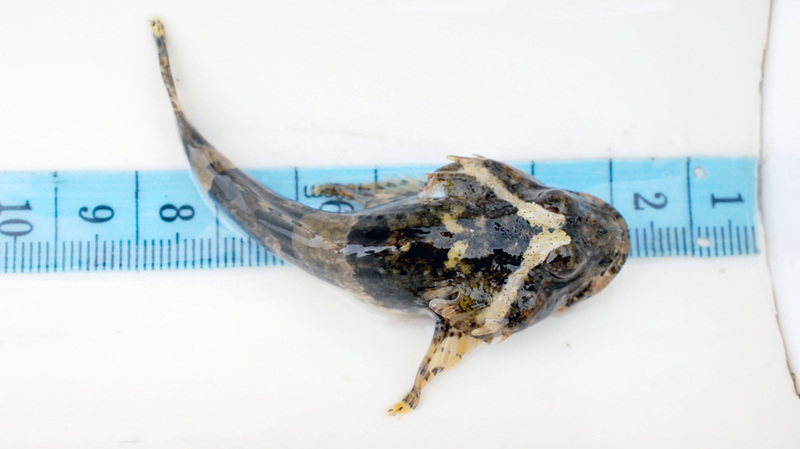 This large sculpin reaches 76 cm (30 inches) long, and has a typical sculpin shape: a large head contrasting with a small body tapering towards the tail, and large fan-shaped pectoral fins. 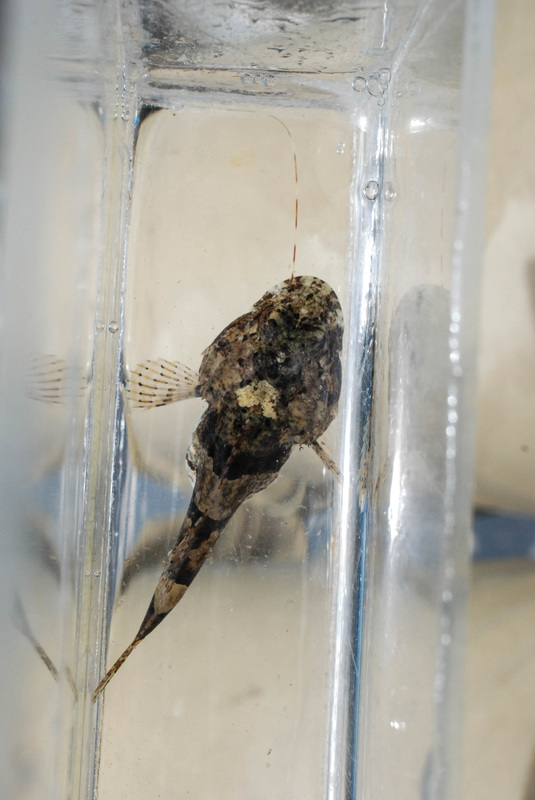 It has a large mouth and one long straight spine jutting out at each cheek; these spines are particularly visible when the sculpin flares them out in response to stress. The great sculpin's colour is usually fairly dull: its back is olive green with four dark saddle patches, its underside is pale, and it has dark bars across its fins. Individuals living in more colourful habitats may themselves be a bit more vibrant. Alongside the single long cheek spines, a key distinguishing feature is a patch of fleshy papillae (bumps) on its head, composed of modified scales. 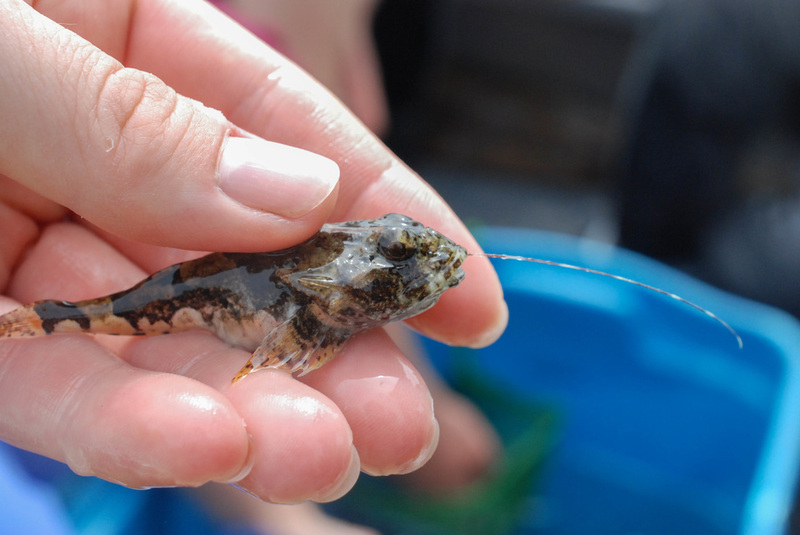 The great sculpin can be found on and around rocky outcrops and nearby sandy areas in the intertidal and subtidal to over 200 m deep or more. Its range extends along the coast of the Pacific Northwest from northern Washington to the Bering Sea coast and Aleutian Islands, and across to Siberia and Japan. 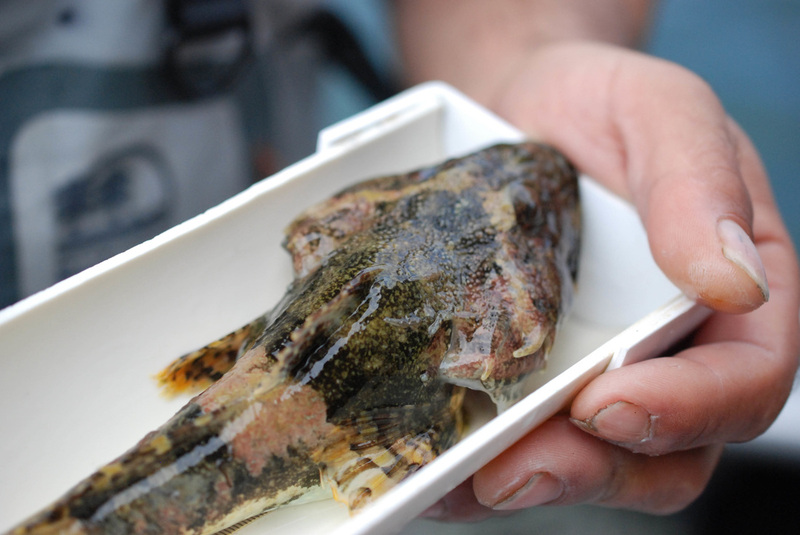 Two similar-looking species, the frog sculpin (M. stelleri) and the plain sculpin (M. jaok), are mostly found in northern Alaska. This species is edible, and may in some jurisdictions be caught commercially. Froese, R. and Orlov, A. Myoxocephalus polyacanthocephalus (Pallas, 1814). FishBase. Accessed 22/02/2019. Lamb, A. and Edgell, P. Coastal Fishes of the Pacific Northwest. Revised. (2010). Madeira Park, BC: Harbour Publishing. Pp. 243.